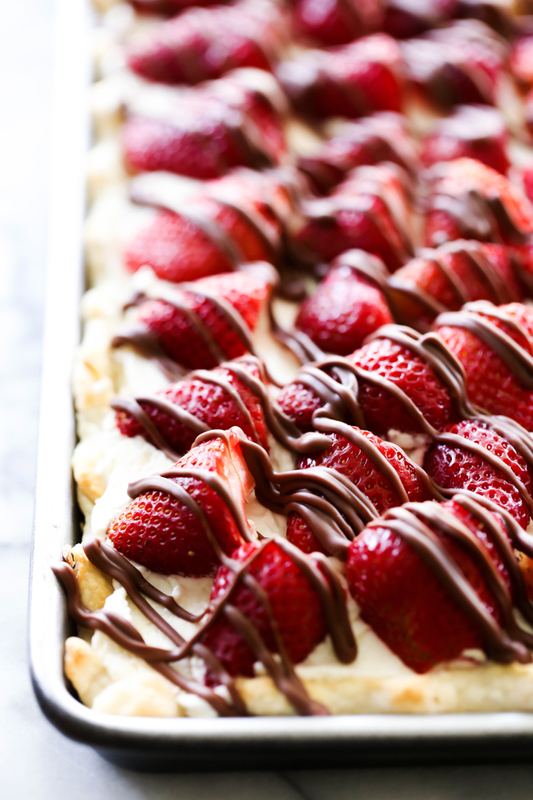 This Strawberry Cream Slab Pie is the PERFECT summertime dessert! 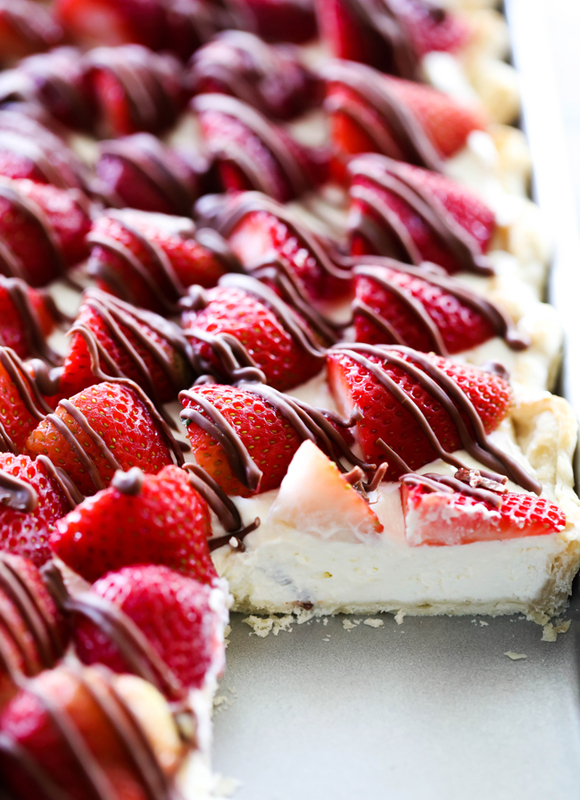 The strawberries are beautifully topped on a cream pie and drizzled with chocolate. This is a great dessert for feeding a crowd and is ALWAYS a hit! First off, Happy Father’s Day to all the Fathers and Father figures out there. I am so grateful for the dads and grandfathers in my life and for the man who is the father to my children and am so happy that we have a day to celebrate you all. I love summertime and all the fresh and ripe fruit in season. Strawberries are always a favorite amongst the crowds and I knew that this slab pie would be an instant hit! 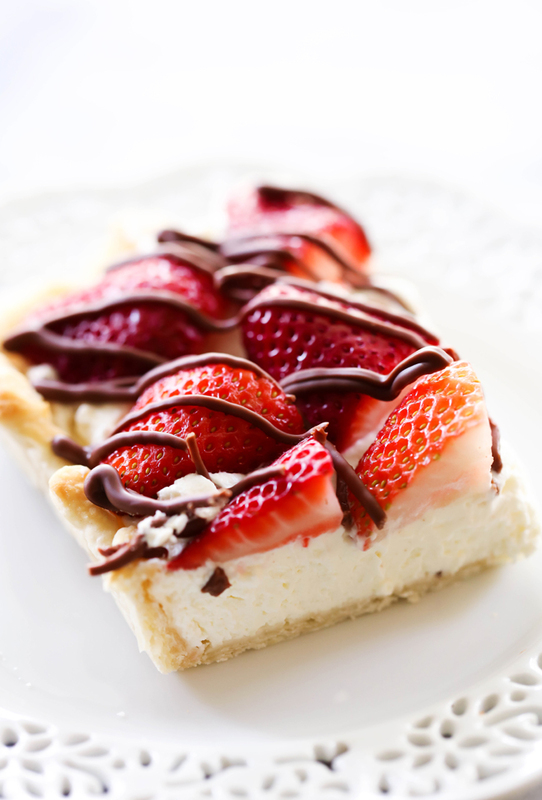 It is creamy and is topped with juicy strawberries and drizzled with chocolate. The ingredients pair so well together. There wasn’t a slice left by the end of our gathering. If you are in need of a simple, beautiful and tasty dessert, look no further! This one is an instant hit will all who try it! Good luck stopping at just once slice! Lay pie crusts onto a flat, slightly floured working surface. Roll dough to a 17x12 rectangle. Place in a 15x10x1 inch pan. Crimp the edges and prick crust with fork. Bake for 8 to 9 minutes, or until golden brown. Let cool. Fold cream cheese mixture into the beaten heavy whipped cream until evenly combined. Spoon into cooled pie crust. Melt shortening and chocolate chips in microwave, stirring every 30 seconds until smooth. Drizzle over strawberries. This recipe is also amazing using an Oreo cookie crust! So where do you add the almond extract in? You list 1 tsp of almond extract in ingredients. It is not used in directions. Is it added to whipping cream? This looks AMAZING!! How many people does this serve? I'm cooking for a community brunch and think this would be a showstopper! Thank you for sharing! Does the Pillsbury pie crust come in the pie tin? Is it round? If so how do you make it fit in a rectangular own, piece it? it comes in a box in the refrigerator section at the grocery store. There are two pie crusts per box. I just rolled them out and trimmed as needed. I want to make the night before for a dinner after work... will that work or will it be soggy?